So last year you bought them an e-reader and this year you're trying to figure out what on earth you might get them to go with it? They probably already have a case by now. And there's always the gift card idea, to let them download their favourite books. But if it's an e-ink reader then you might have heard them say how great it is, except for when the sun goes down. In the winter, when it gets dark early and the bus lights are low, it can be pretty hard to read on the commute home. And reading before bed means keeping the lights bright in the room. Thankfully, there are some pretty portable reading lights out there and many that attach to readers. And then there is this LED light. 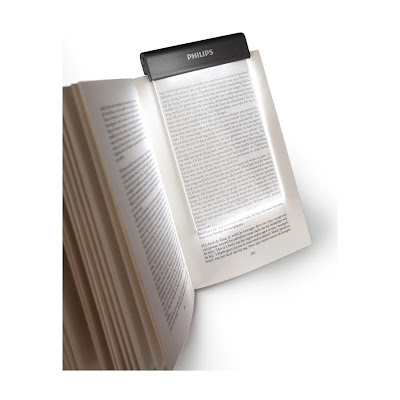 The Philips Rechargeable LED Reading Book Light is quite different from any book light I've seen in our local book stores and even online. Sleek and slim (they claim it doubles as a bookmark! ), this light has a unique design which allows it to cover the entire screen (or book page). It boasts multiple brightness settings and a long charge (and recharge via USB) which makes it perfect for the road warrior. I can think of many a car or bus ride when this would have been awesome for my Kobo, or even for the Dude sitting in the back reading his graphic novels. And being plastic, it would be robust enough to trust him with. And it stays cool, so it would be safe enough for him to use too. I've only managed to find it on Amazon UK, US and Canada, so if you want one, those are probably the best places to go.